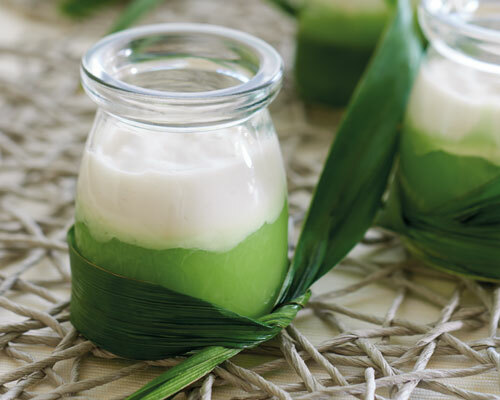 Prepare pandan juice by cutting pandan leaves into small pieces and blend until fine with 4tbs of plain water. Using a strainer, squeeze the juice out of the leaves. Blend the pandan juice with rice flour, water and sugar. Cook over low heat while stirring continuously. Cook until it thickens into a smooth paste. Remove from heat. For texture, you may add in 1 can of nata de coco (drained and roughly chopped). Pour bottom mixture into 10 inch round tin or into small ramekins. Steam until cooked and let it cool. Combine ingredients in a pot and cook over low heat while stirring continuously. Cook until smooth and thick. Pour mixture over the bottom layer. Let it cool and refrigerate to serve chilled.